Oct 9th, 2017. Adjusted one feature (removing reference to Quickness skill & replaced with initative). Dec 10th, 2015. Moved to own page. Some major edits, inc to number of PPs and techniques. Whereas the blade dancer is a flurry of movement in a battle, the duelist is a lightly armored fighter that maintains composure, form and balance. Stances and precise attacks are the duelist's forte. You may refer to yourself as a duelist or fencer or as a member of a particular fighting academy. The feats Defensive Duelist, Dual Wielder and Mobile are popular with duelists. A duelist uses a mechanic similar to the monk's ki feature, but instead uses Panache Points. Many techniques are similar to the Battle Master's maneuvers, but the mechanics used for accessing and using them is simpler. Instead of rolling extra dice, the duelist plays off their proficiency bonus or secondary ability modifiers. 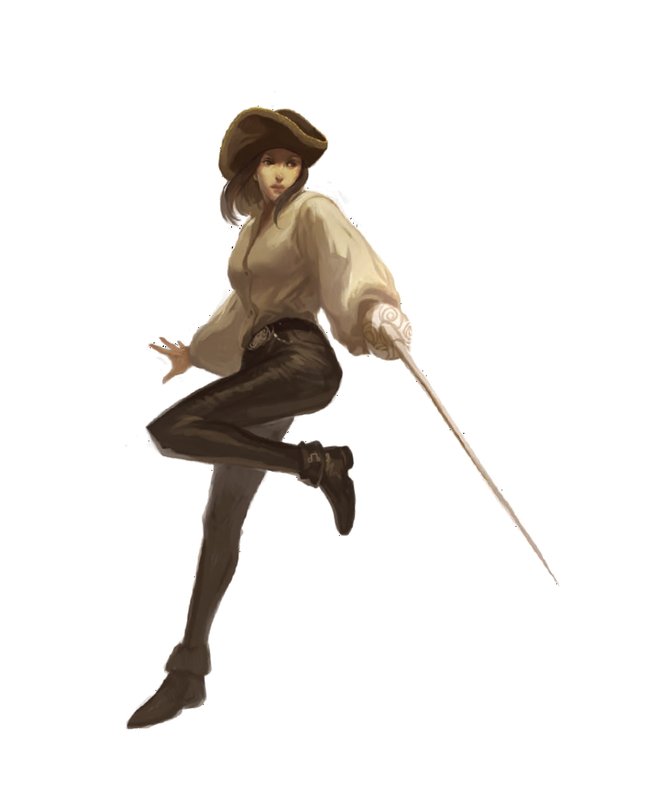 The duelist typically has fewer maneuvers, but more opportunities to use their signature moves. Starting at 3rd level, you can tap into a pool of Panache Points that allow you to perform daring feats and employ specific combat moves called techniques. Techniques chosen could be used to reflect individual styles taught at fighting academies. You begin with 4 panache points. You gain a another 2 panache points at 7th, 10th, 15th and 18th level. This pool of panache replenishes after you take a short or long rest. You can spend these points to initiate various panache features called techniques. You cannot spend panache points to perform techniques if you are wearing heavy armor or wielding a shield (though you may use a buckler), or encumbered in any way. Canny Defense. Whilst you have at least one panache point, your AC equals 10 (or the value of your light armor) + your Dexterity modifier + your Intelligence modifier. You cannot wield shields with this class feature, though bucklers are allowed (if you have them in your game). This counts as a version of Unarmored Defense. Composure. You add your Charisma bonus to Initiative rolls. In addition, when attacking a creature with a weapon with the finesse or light property in the first round of combat and you have a higher initiative roll than the target, you can spend a panache point to gain advantage on the first attack roll you make that turn. Deadly Precision. As long as you have at least one panache point, you score critical hit on a roll of 19 or 20 when wielding weapons with the finesse or light properties. Deft. You can spend a panache point to take the Dash, Disengage, or Dodge action as a bonus action on your turn. Reflex Parry. When another creature damages you with a melee attack, you can use your reaction and expend one panache point to reduce the damage by a number equal to your Initiative modifier. Riposte. When a creature misses you with a melee attack roll, you can spend 1 panache point and use your reaction to make a melee weapon attack against that creature. If you hit, you add your proficiency bonus to the damage. You must be able to reach the target to use this technique. Unexpected Strike. When wielding a light weapon in your off-hand, you can spend a panache point to make an attack with this weapon as part of a regular Attack action. All normal rules for fighting with two weapons apply (such as not gaining ability bonuses to damage). This can be combined with the ability to use a bonus action with your off-hand weapon. 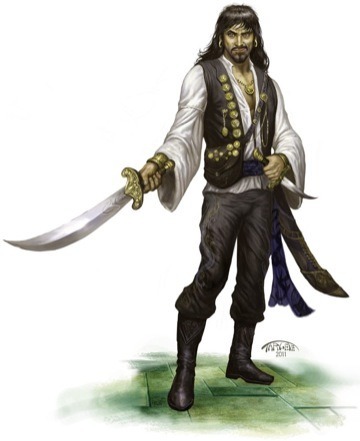 Also when you choose this archetype at 3rd level, your attacks with weapons that have the finesse and light qualities, or belong to the Short Blades Weapon Group, gain the Disarm quality if they do not already have it. (See the En5ider article As Good As His Blade for the disarm property). Beginning at 7th level, you can spend 2 panache points to gain advantage on any Intelligence, Wisdom or Charisma saving throw or any Charisma ability check. At 10th level, you can choose a second option from the Fighting Style class feature or you can choose 2 advanced techniques. (You may also choose from the techniques gained at 3rd level if you wish). Advanced Dueling. You can spend one panache point to add half of your proficiency bonus to the damage dealt for all melee weapon attacks made this round with weapons from the Short Blades Weapon Group. (This damage stacks with the Dueling Fighting Style if you have chosen that). Deadly Deflection. If an enemy within 5 feet of you misses you with a melee weapon attack, you can spend one panache point and your reaction to make them reroll their attack against any other creature of your choice within 5 feet of the enemy re-rolling the attack. Defensive Fighter. As long as you have at least 1 panache point in your pool, all light and finesse weapons you wield gain the defensive property. (Their bonus does not increase if they already have this property). Furthermore, you do not lose the bonus gained from weapons with the defensive property when you attack with them. (See the En5ider article As Good As His Blade for the defensive property). Feint. You can expend one panache point and use a bonus action on your turn to feint, choosing one creature within 5 feet of you as the target. You have advantage on your next attack roll this turn against that creature. If the attack hits you add your proficiency bonus to your damage roll and the next attack made by another creature versus the target also has advantage on the attack roll. This advantage is lost if no other creature has attacked the target by the start of your next turn. Painful Strike. When you hit with a weapon attack that deals piercing damage, you can spend one panache point to attempt to stun the target. The target must make a Constitution saving throw or be stunned until the end of your next turn. (The DC for this save = 8 + your proficiency bonus + your Dexterity modifier). Sure Strike. On your turn, you can spend one panache point and use a bonus action to add double your proficiency bonus or your Dexterity modifier (in place of using it once) to one attack roll when using a finesse weapon. Crippling Strike. When you score a hit with a finesse weapon, you can spend one panache point to deal a partial critical. (This relies upon our optional Critical Charts, and means you roll 1d10 on the first column). Daring-Do. You can spend one point of panache to gain advantage on one Dexterity (Acrobatics), Strength (Athletics) or initiative roll. Difficult Target. As long as you have at least 1 panache point in your pool, you gain the benefits of the Evasion feature (as the monk ability, PHB p79). You also gain the Deflect Missile feature (as the monk ability, PHB p78), but you must be wielding a weapon with the defensive quality and spend a panache point to use this feature. You cannot catch the missile if you reduce the damage to 0 hit points, but you can spend another panache point to redirect the attack at a target within 5 feet of you. You make an attack roll as if you were using the weapon you used to deflect the missile. The damage from the original attack is now applied to the new target. Ultimate Dueling. You can spend one panache point to add your proficiency bonus to the damage dealt for all melee weapon attacks made this round with weapons from the Short Blades Weapon Group. (You must have the Advanced Duelling technique to gain and use this technique). At 18th level you gain the elusive feature, as the rogue ability, (PHB p96).